Have you ever been struck by a beam of high energy particles? Surely you have – it happens all the time, only that we do not notice it. Every second , in fact, our planet crosses particles coming from Space. These are called cosmic rays. They are defined rays, but are significantly different from the electromagnetic radiation that we know. Starting from the first decade of the twentieth century, cosmic rays have been one of the main fields of investigation of particle physics, and their study has enabled us to further increase our knowledge of subatomic particles. 100 years after their discovery, there still is a lot to understand about their origin and about the interconnections between astrophysics, particle physics and physics of the atmosphere. Cosmic rays are mainly charged subatomic particles coming from Space. They are very energetic and travel at a speed that is almost the speed of light, continuously bombarding the Earth from all directions. At the end of the 17th century, Charles de Coulomb proved that the air of the atmosphere has a mild electrical conductivity, i.e. the atoms of the Earth’s atmosphere are constantly ionized and the charges that are freed in the ionization process are responsible for the conductivity. 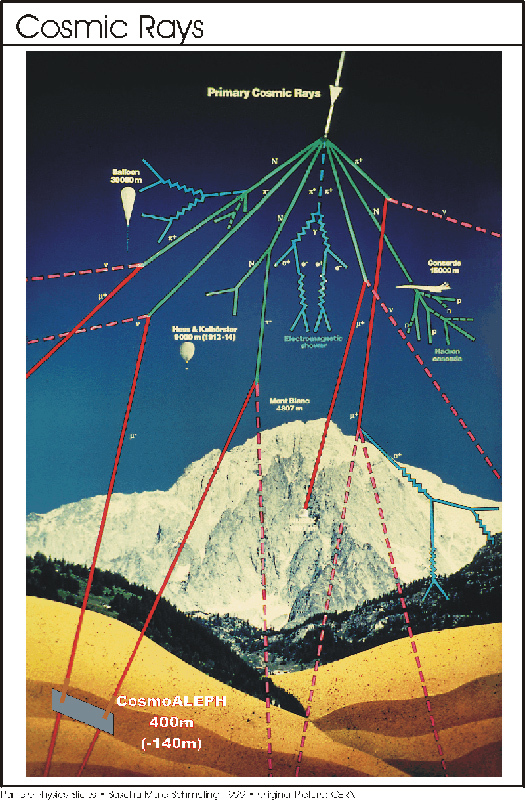 In order to explain the conductivity phenomenon, it was hypothesized that air was ionized by unknown rays, produced by natural radioactivity emitted by our planet. In order to detect the radiations electroscopes, whose operation was well known, were used. It was noted that also when no radioactive substances were present in the vicinity, the electroscopes would lose their charge, that showed clearly that some form of radiation was present. Furthermore it was noted that this radiation was present everywhere. Had the radiation been produced by the Earth, it could have been expected that the signal would decrease exponentially at a greater distance from the ground. This is what Father Wulf tried to verify in 1910 when he positioned an electroscope on top of the Eiffel Tower, 300 metres above ground. The result was exactly the opposite. The signal decreased much less than what was expected. Father Wolf hypothesized that this radiation might be of an extra-terrestrial origin. In support of Father Wulf, also the Italian physicist, Domenico Pacini, carried out his experiments on the destroyer “Fulmine”, and came to the conclusion that in the atmosphere there is a remarkable ionizing cause with penetrating radiations, independent from the direct action of the radioactive substances of the ground. 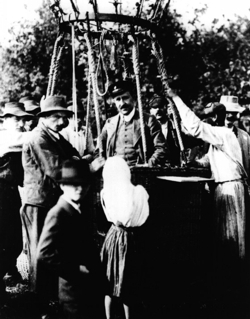 Pacini finally defined the extra-terrestrial nature of the cosmic rays before the experiments of the physicist Victor Franz Hess, who has always been considered the physician who discovered this radiation. In fact, starting from 1911, Hess carried out a series of experiments at high altitudes, with the help of aerostatic balloons. Hess observed that as the distance from the ground increased the level of ionization decreased, but much more slowly than expected, in fact the values actually stabilized around 700 metres. During the flight he went on in August 1912, Hess reached an altitude of 5350 metres. When he rose above 1500 metres he observed that the signal started to increase, and at 5000 metres its value was double the amount at sea level. Hess explained the results, hypothesizing the presence of a new highly penetrating radiation coming from Space, that crossed the atmosphere producing the phenomena that were observed. Furthermore Hess observed that the intensity of the radiation did not change during the night and during the day, and not even during an eclipse, therefore the Sun could not be the source of these radiations, but they had to be produced in Space by sources that were much further away than the Sun. It was 1912, when Höhenstrahlung was discovered, i.e. radiation from above. Hess received the Nobel prize for this discovery in 1936. The term cosmic rays was coined later, in 1925 by the American physicist Millikan. In fact he believed that cosmic rays were exclusively very high energy electromagnetic radiation, of very energetic gamma rays. 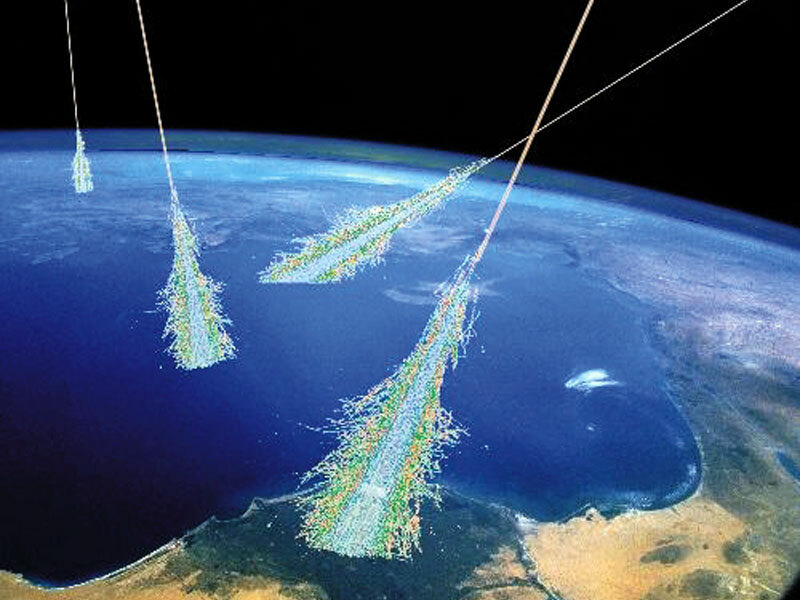 Some questions still remained unanswered, Where did the cosmic rays come from? What kind of radiation was it? Was it a very high energy electromagnetic radiation or particles travelling at a very high speed? A big step forward in understanding the nature of the cosmic rays was made by using various Geiger counters that could define the direction the cosmic rays were coming from simultaneously. This technique was developed by Bothe and Wener Kolhorster in Berlin, who were the first to build a cosmic rays detector. The measurements were also carried out introducing absorbing material between the two detectors. The data showed clearly that the cosmic rays could cross blocks of heavy material (for example gold) up to 4 cm thick. The conclusion was that cosmic radiation could not be made up of gamma radiations but had to be made up of highly penetrating charged particles. The Italian physicist, Bruno Rossi invented electronic coincidence circuits with which he measured the coincidence of the detectors positioned vertically and of detectors positioned horizontally. In the latter case he obtained the first proof of showers of secondary particles. With the help of a cloud chamber, the Russian physicist Dmitry Skobeltzyn was able to photograph the traces left by charged particles coming from the atmosphere. Due to their high energy, these particles could not be the product of the radioactive elements decay, but had to be the secondary products from the interaction of cosmic rays and the atmosphere. 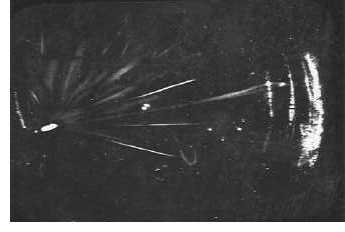 In 1932, during the experiments on cosmic rays using cloud chambers, the physicist Carl Andersson observed traces of particles with curvatures that were the opposite of those left by the electrons. And so the existence of a particle with the same mass as an electron, but with an opposite charge was discovered, and named positron. The photograph with which the physicist Carl Andersson established the existence of the positron Thanks to this discovery, Andersson won the Nobel prize for Physics together with the physicist Hess in 1936. At the start of the 30s, it was quite clear that the cosmic rays that reached sea level were certainly made up of electrons and positrons. Was there anything else? In 1937 Carl D. Anderson and Seth H. Neddermeyer, and almost at the same time, J.C. Street and E.C. Stevenson discovered the existence of a new particle whose mass was similar to the electron and the proton, which had a short life-time. And so, in the cosmic rays, the muon was revealed. 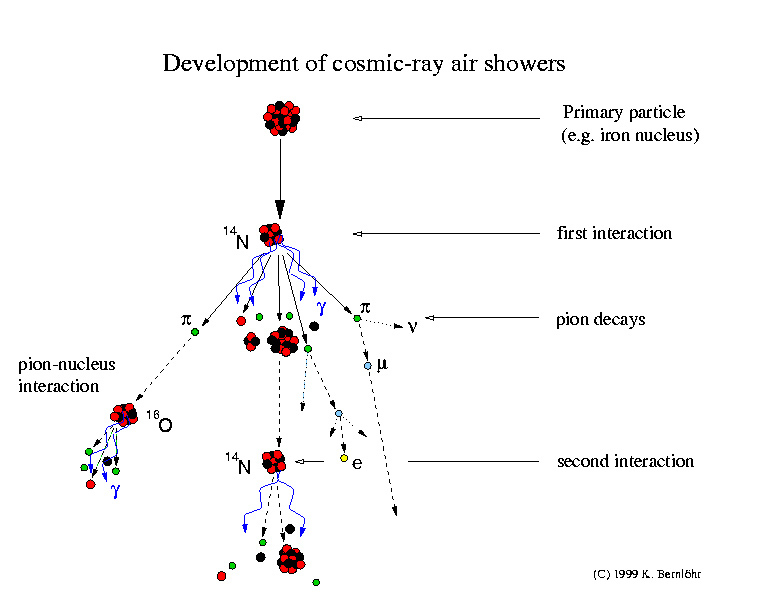 From the end of the 30s elementary particle physics started to evolve, and cosmic rays were used to discover new particles (such as the pion), up to the invention of particle accelerators in the 50s. The cloud chamber was invented by Charles T.R. Wilson in 1911. 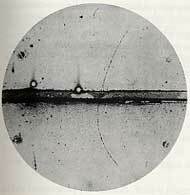 It was the first instrument that was able to visualize the trace of ionizing particles. When a particle crosses the chamber which has previously been filled with oversaturated vapour, it generates a condensation of ions along its trail. In this way it is possible to see its trace with a naked eye, and it can also be photographed. 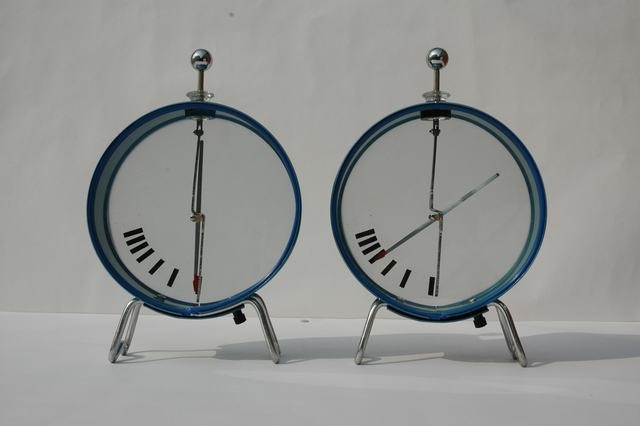 In 1938 Pierre Auger and Roland Maze observed that the Geiger counters which were positioned various metres from one another, registered the arrival of cosmic ray particles at the same time. This result proved that the secondary particles were produced by a common source. In other words the interaction of primary particles with the atmosphere produces a shower of secondary particles that reach the ground. These experiments definitively confirmed the existence of extensive showers of particles, known as Extensive Air Showers (EAS). Auger also measured the energy of the showers, that reached 1015 eV (one electron-volt is the energy acquired by a free electron when it passes through a 1 Volt difference in electric potential), an enormous energy for the times, in fact the energy limits that were observed never exceeded one Mev (106 eV). When an energy particle (in 90% of the cases a proton, and in 10 % of the cases neutrons and nuclei up to Iron nuclei) crosses the Earth’s atmosphere, its collision with the nuclei in the air (on average, at an altitude of 10 km) gives rise to a shower of lower energy secondary particles, which in turn produce a shower of billions of particles that reach the ground in an area that can stretch up to various square kilometres. When analysing the showers it was discovered that they consist of almost all the particles that are known today: nucleons, nuclei, high energy gamma rays, all types of mesons (π±,π0,K±, …), charged leptons (e±, μ±, τ±) and also neutrinos. What energy do cosmic rays have? Cosmic rays have energies that vary between 108eV and 1020eV, and the lower energy rays are more numerous while their numbers decreases with the increase in their energy. In fact the number of cosmic rays with energies amounting to 1020eV are about 1 per sq. km. per century, this is the reason why it is so difficult to observe events with extremely high energy particles. Events with 1020eV energies are therefore very rare, but their study is fundamental in order to understand where they come from and what source produces them. A solution of these mysteries would enable us to revolutionize astrophysics and, for instance, answer the questions, “are extremely high energy cosmic rays tied to the Big Bang? and to the Dark Matter?”. Furthermore, it must be pointed out that energies that are so high cannot be reached , not even in CERN’s LHC large collider, where the maximum limit is about 14 TeV (1013 eV). Cosmic rays have an electric charge and therefore are subject to deflections caused by galactic magnetic fields and also the Earth’s magnetic field. Therefore when they come near to the Earth they are deflected from their original direction. For this reason we are unable to understand where they come from and therefore where they originate. However, depending on the energy of the cosmic rays, it is possible to establish the probable sources where they originated. From this graph, which indicates the flux of cosmic ray incidence on the Earth’s atmosphere, depending on their energy, it can be observed that for energies ranging from 109 to 1010 eV the source is the sun, for energies ranging from 1010 to 1015 eV the source is galactic, probably tied to the explosions of supernovas, and for energies ranging from 1015 to 1019 eV the source is extragalactic, tied to active galactic nuclei or pulsars with intense magnetic fields. 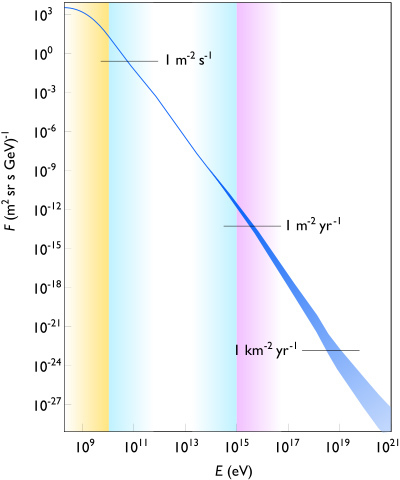 For energies over 5 x 1019 eV, known as the GZK limit (from the names of the scientists Greisen-Zatsepin-Kuzmin who defined it), the origin is still unknown and has been the most active area of research in these recent years. Astrophysicist scientific divulger, for the Planetarium in Turin, she is in charge of training and development and display of museum exhibits.